Payment- Fees are due and payable on the first of each month. Your monthly fees can be paid by cash, cheque, online banking, or CAFT (Customer Authorized Fund Transfer). If your child is absent due to sickness, vacation or for other personal reasons, it is still necessary to pay the full fee in order to maintain your child’s space. Failure to pay the full child care fee will result in termination of your child care space. A $15 Late Fee will be charged to accounts. NSF Fee- If funds are unavailable the WCC will attempt to withdraw fees a second time (up to 30 days from original payment date). The WCC may charge a fee of $15 if funds are unavailable at the time of withdrawal. The WCC will not be responsible for any costs charged by your bank/financial institution. Annual Membership Fees- ($60) will be posted to your account each June 1st. This Membership entitles you to be a voting member of the Whistler Children’s Centre Society, and helps defray the cost of maintenance and insurance. Child Care Fee Reduction Program The Provincial Government announced in their 2018 Budget, extra funding to licensed child care providers so that they in turn can lower their fees for families. The Whistler Children’s Centre has chosen to opt-in to this program. Affordable Child Care Care Benefit This funding helps families with the cost of child care, depending on factors like family size, type of care and household income. Please see the BC Government website regarding application process. Withdrawal or Change of Days- If you wish to withdraw your child, drop a day, or request a change in days, you are required to provide one month written notice. Withdrawals or changes need to be submitted to the Executive Director from the 1st of the month prior for the 1st of the month you wish to withdraw your child (i.e. for a withdrawal of May 1st, written notice must be received on or before April 1st). An additional month’s fee will be charged if the required notice is not given. Upon withdrawal, if there are outstanding fees, the WCC may release your personal information to a 3rd party collection agency for the purpose of recovering any outstanding debt. Child Care Tax Receipts- Issued in late February each year for prior year’s income tax purposes. Receipts are only mailed if requested. Scheduling- Enrollment is managed on a monthly basis and fees are paid monthly. Fees remain the same regardless of how many allowable days a child can attend within the month. We do not have a daily rate. We do not allow families to trade days or drop-in days. Monthly enrollment is managed by the Executive Director and sporadic drop-in days are managed by the program staff and based on availability. Additional fees apply for drop-in days. When families withdraw days to attend ski school and/or bike programs and request re-entry for a later date, space is not guaranteed and is based on availability. 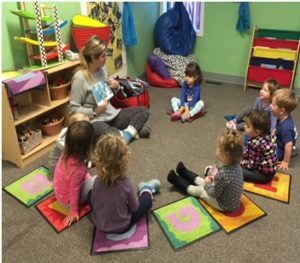 Calculation of Child Care Fees- Fees are charged for monthly enrollment and are based on the assumption that the average month has four weeks of childcare days. However maximum available child care days vary from month to month as some months have 4, 4.5, or 5 weeks in them. If a child is enrolled full-time, five days per week, we assume the child will receive at least 20 days of care in any given month (5 days/week x 4 weeks). If a child is attending part-time, 2-4 days per week, the same assumption applies. Based on a four week month, a child attending 2, 3 or 4 days per week, will receive 8, 12, or 16 days of care, respectively. We make this assumption to create allowances for statutory holidays or other Centre closures. For example, a child attending full-time, 5 days per week, may actually attend 23 days, but has only paid for 20. This also occurs for children attending 2, 3 and 4 days per week, where they actually receive more days than what is paid for in the fee structure.